ArcGIS was used to create the underground 3D environment. Once utility pipe horizontal and vertical elevation values were determined, the Green Square Complex 3D Utility Inventory was rendered. With advanced utility mapping using GIS and 3D GIS modeling, facility managers developed a utility inventory atlas. The Green Square Complex—located in the heart of Raleigh, North Carolina's capital city—is a two-block, multiuse sustainable development project that is now home to North Carolina's state environmental offices and the new Nature Research Center. The complex includes two beautifully designed "green" buildings that integrate the gold standard of sustainable design strategies, costing less to operate and maintain by incorporating energy- and water-efficiency techniques. 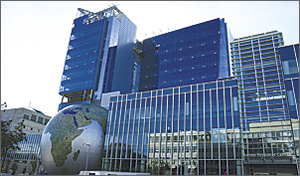 The Green Square Complex was built in conjunction with the Department of the Environment and Natural Resources (DENR) and the North Carolina Museum of Natural Sciences to enable those organizations to lead by example in promoting stewardship and the Leadership in Energy and Environmental Design (LEED) Gold Standard. The Green Square Complex in Raleigh, North Carolina. The new DENR office is a five-story building and connects via a one-level bridge over McDowell Street to the remaining DENR offices in the adjacent block. The second building in the Green Square Complex is the Nature Research Center, which will connect to the existing North Carolina Museum of Natural Sciences on the opposite side of the complex via a two-story bridge over Salisbury Street. The research center was built for scientists to conduct their research while visitors from the neighboring museum observe science in action. 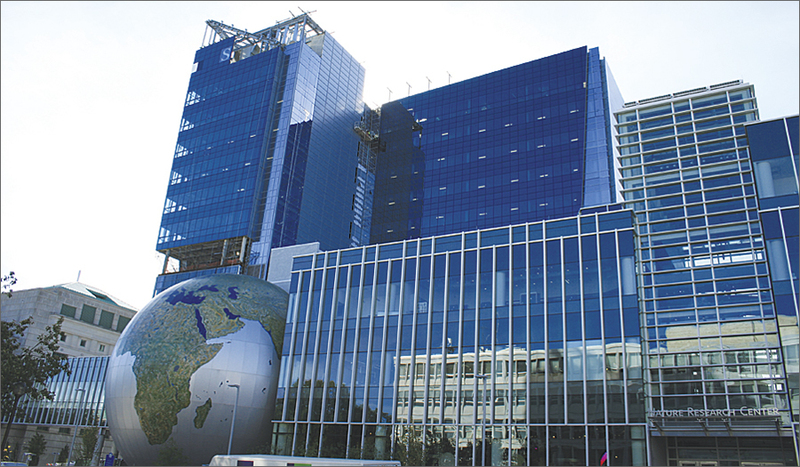 Its most unique design feature is a 50-foot globe of the earth called The Daily Planet. In spring 2008, planning for the construction of the new buildings and a parking garage on the Green Square Complex began. The civil and structural engineers needed critical depth information regarding the location of the existing above- and belowground utility infrastructure in the roadway around the block. 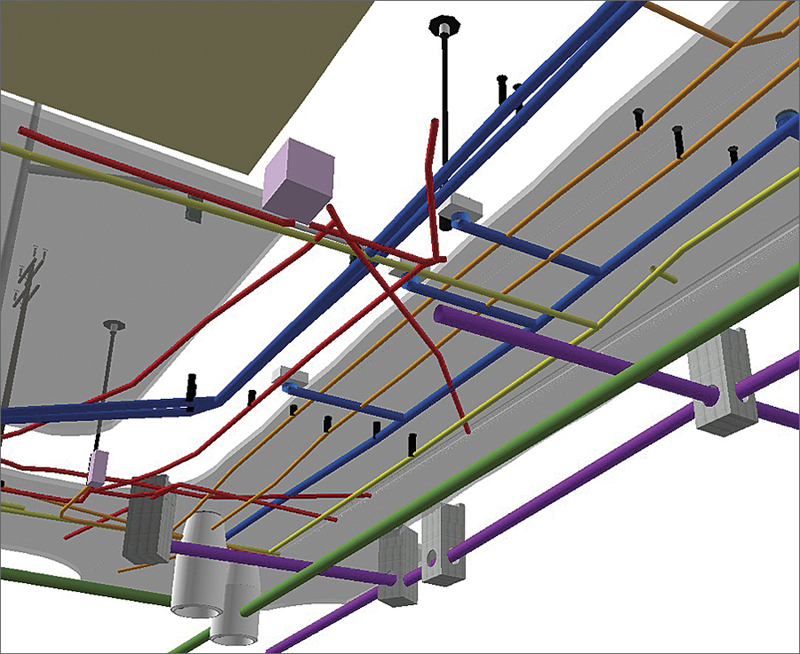 Following a review of engineering firms, the project engineers contracted with Esri Partner McKim & Creed's Subsurface Utility Engineering (SUE) team (Raleigh, North Carolina) to provide the detailed underground utility mapping. By using SUE-quality level A locating services (the highest level of accuracy), which uses nondestructive pneumatic vacuum excavation to expose subsurface utilities, data regarding the precise vertical and horizontal pipe diameter and type of utility was collected for accurate planning for the construction of the project. While the standard delivery method for this sort of information is typically a CAD or MicroStation drawing file, with so much exact data and information collected, the team created a GIS geodatabase to house the information. Underground utilities beneath McDowell Street in downtown Raleigh, North Carolina. To protect the foundation of the existing Old Education Building (built in 1938) located on the Green Square Complex block required the stabilization of the soil in a pit dug around the perimeter where the two new buildings needed to be constructed. A technique called soil nailing or pinning was employed to shore the soil slope and prevent landslides by inserting steel reinforcement bars into the soil and anchoring them to the soil strata in a pit roughly 40–50 feet deep. The construction process starts by drilling holes for the steel bar and grouting the nails into the soil to create a composite mass. Precise SUE data was used for determining the drilling location so the nails would not be bored into the utilities. Since the SUE team collected 139 test hole locations (pneumatic vacuum excavated) on the utilities, a true-to-life, three-dimensional model was created of the underand aboveground features around the Green Square Complex to assist in determining the nail locations. Using ArcGIS (ArcScene with the 3D Analyst extension) to create the 3D environment, a triangular irregular network was generated from the survey contours to establish the ground surface elevation. The building corners were surveyed and the footprints extruded as a multipatch feature class. An existing 3D building model (downloaded from the Trimble 3D Warehouse) on the Green Square Complex block was imported to replace one of the existing buildings. The utility pipe geometry was given the correct elevation values based on the test hole data. Once all the data was spatially correct horizontally and vertically, the Green Square Complex 3D Utility Inventory was ready for rendering. Many of the point features are imported from the file model components, such as the sanitary sewer manhole covers, the concrete underground storm water drains, and the power and telephone utility poles. The pipes are 3D simple line tube symbols color coded per specific utility system (blue for water, red for electric, green for sewer, orange for telephone/fiber optics, yellow for gas, and purple for storm water). When the existing pipes were removed and/or new ones added during the Green Square Complex construction phase, the information was captured for easy updates to the utility inventory atlas that the city maintains, thereby taking the SUE data to a higher level. For more information, contact Julie Willett, GISP, McKim & Creed (tel. : 919-233-8031), or W. Sean Patterson, SUE, McKim & Creed (tel. : 919-233-8031).